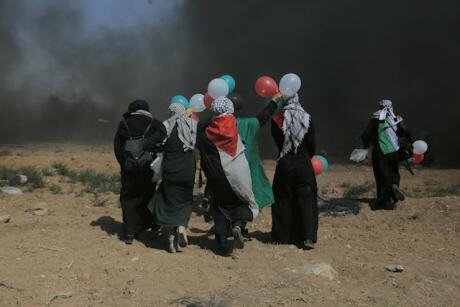 Palestinian protesters at the Gaza border. Picture by NurPhoto/SIPA USA/PA Images. All rights reserved. The Return March, which has just ended, was unique in recent history in Gaza for a number of reasons. Palestinians there are known for engaging in militant resistance against the Israeli occupation and also for the internal political split in their ranks between two dominant factions, Fatah and Hamas. Yet, in these weeks, the March has been characterized by a popular, predominantly nonviolent mobilization during which Gaza's fractured political parties have demonstrated a surprising degree of unity. And perhaps most noteworthy of all, women activists have played a visibly crucial role in the protests on a scale not seen for decades, possibly indicating what the future may look like when it comes to activism in the Gaza Strip. The Return March began on March 30th, or Land Day, commemorating the 1976 killings of six Palestinians inside Israel who had been protesting land confiscations. The March was slated to end on May 15th, the 70th anniversary of the Nakba, Arabic for "catastrophe." The term is used to refer to the 1948 war that led to the creation of Israel and the displacement of approximately 750,000 Palestinians, as well as the depopulation of more than 450 Palestinian towns and villages. Seventy percent of Gaza’s blockaded population is made up of those who fled or were expelled from their lands and villages during the Nakba or their descendants. The vast majority of those participating in the Great Return March, including Abu Mosa, know those native villages only through family lore, yet their yearning to return is visceral. Iktimal Hamad is on the Supreme National Commission of the Return March, the only woman among the March’s 15 lead organizers. Sitting in her Gaza City office, her light brown hair pulled into a tight bun, she speaks about her own double agenda -- to end the Israeli occupation, but also to promote equality for women in Gaza. “Women can play a prominent role in the liberation of Palestine, because they are integral to the Palestinian community,” she tells us. The Oslo Accords led to the creation of the Palestinian Authority and the return of the exiled PLO leaders to the West Bank and Gaza. Many of the grassroots activists who had led the uprising were promptly marginalized in the formation of new leadership structures -- and women were excluded altogether. According to Samira Abdelalim, the trajectory of the struggle, and particularly the role of women, then shifted radically. There was now an armed, institutional Authority governing a traditional, patriarchal society. "The male societies refused to include women in the decision-making units, and denied women’s [engagement] in policies and plans," she explains. So, rather than confronting the Israeli occupation, Palestinian women began agitating for social, political, legal, and economic rights within Palestinian society. Abdelalim and other women activists organized around the task of creating laws to protect women from honor killings -- that is, the murder of a female family member when she is perceived to have brought shame upon the family -- and to prevent gender-based male violence. This sort of activism, however, was predominantly open only to women from a higher socio-economic class -- those, in particular, who worked for NGOs, had access to university education, and had some ability, however restricted, to reach the outside world, whether through travel or the Internet. Many of the women who had been out on the streets during the First Intifada were left without roles to play.